Many solutions will be provided to you this semester as stock solutions. A stock solution is a solution that has been prepared with a greater concentration of solute than is needed for a biochemical procedure, so it must be diluted to the proper concentration(s) before use. Consequently, it is very important that you master the concepts and techniques of preparing dilutions early in the semester. A dilution is made by taking an aliquot (a measured portion) of a stock solution, and adding to it an aliquot of a solvent (usually water). This creates a new solution with a lower concentration of solute than was contained in the stock solution. Since the solute concentration of the stock solution is known as well as the volumes of stock and solvent, it is possible to calculate the concentration of solute in the dilute solution. The dilute solution is always less concentrated than the stock or starting solution. There are several ways to describe and prepare dilutions. 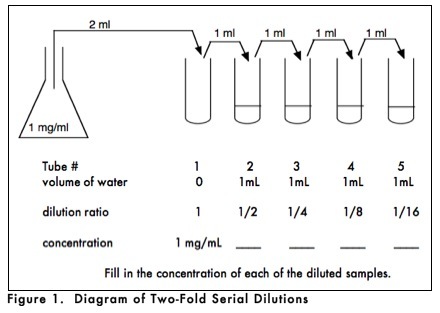 Explanations are provided in this section as well as a laboratory exercise to introduce you to dilution preparation. Each pair will use either the 0.11M cupric chloride dihydrate (CuCl2•2H2OH20) or the 0.26M cobalt chloride hexahydrate (CoCl2•6H2OH20) stock solution prepared in Lab 1 to prepare a series of 4 dilutions. Each dilution in the series will differ from the previous dilution by 1/2, so the dilution ratio for each tube is 1/2, 1/4, 1/8 and 1/16. Calculate the concentrations of cupric chloride or cobalt chloride that the tubes will contain after the dilutions have been prepared, and record them in your lab notebook. Using a clean pipette tip, remove 100 μL of solution from the 1/16 tube, and discard it in the sink. You now have four tubes containing 100 μL of four different concentrations of stock solution. Observe the color intensity of the four solutions and record in your lab notebook. Also, observe the relative volumes of the four solutions. If they are different from each other, then inaccurate pipetting has occurred. Save these dilutions for use in Part II, the toxicity study below. It is often important to know the effective (final) concentration of a reagent in a particular reaction, such as, when you perform the toxicity assay of your heavy metal in PART II. If you find that the heavy metal is toxic to Tetrahymena at some concentrations, but not at others, you need to be able to calculate and report the concentration range of non-toxicity or toxicity. If you combine equal volumes of Tetrahymena and a dilution of your cobalt or cupric chloride solution on the slide, you have, effectively, diluted the heavy metal by 1/2, resulting in an final concentration of half the concentration in the serial dilution tube that you used in the experiment. In order to calculate effective (final) concentration, you must know the concentration of the reagent of interest in each of the working dilutions. In the experiment described below, concentration of the working dilution would be the concentration of the cobalt or cupric chloride in each of the serial dilutions (in moles this time, but concentration could be expressed in any units of concentration, such as mg/ml or %(v/v or wt/v). You must also know the ratio of the amount of the reagent of interest (cobalt or cupric chloride) to the total volume of the final dilution. In the case of the experiment in PART II below, you are going to use 20 μL of live Tetrahymena together with 20 μL of 0.11 M copper chloride or 0.26 M cobalt chloride. The ratio is 1 part metal to two parts total, so the dilution factor is 2. What if you used only 5 μL of metal and 20 μL of Tetrahymena? In that case, there is one part metal in a total of 5 parts of final dilution so the concentration of the metal would be reduced 5 fold (multiply the conc. of the metal x 1/5). Sometimes you know the final concentration of a reagent that you want in a reaction and you need to make a working dilution of a stock to achieve that final concentration in an experiment. For example, if you read a paper that said that Tetrahymena were fixed in a final concentration of formaldehyde of 0.4% (v/v). You have a bottle of stock 100% formaldehyde. You know that you are going to put 20 μL of Tetrahymena on a slide and combine them with 10 μL of a dilute formaldehyde solution. How are you going to make that dilute formaldehyde solution (working solution) from the 100% stock formaldehyde to give you a final concentration of formaldehyde of 0.4%? Answer: There will be one part of working formaldehyde solution of unknown concentration in a total of three parts (2 parts of Tetrahymena + one part of formaldehyde) so you will be diluting the working solution of formaldehyde by a factor of 3; therefore, you want the working solution to be three times more concentrated than 0.4%, or 1.2%. Since you are only going to use 10 μL of it, you could make 1 ml of 1.2% working dilution of formaldehyde from the 100% stock. Using V1 x C1= V2 x C2, where V1 is the unknown. (V1)(100%) = (1 ml)(1.2%). Combining 12 μL of 100% formaldehyde with 888 μL of water would give you 1ml of the appropriate working dilution of formaldehyde to achieve a final concentration of formaldehyde of 0.4%. Each pair of students will use either the cobalt chloride or copper chloride solution to carry out a Tetrahymena toxicity study. Combine 20 μL of live Tetrahymena with 20 μL of 0.11 M copper chloride or 0.26 M cobalt chloride in a clean microfuge tube. What is the concentration of the heavy metal in moles? Wait 1 minute, and then add 20 μL of those Tetrahymena (from the microfuge tube) to a glass slide, add a cover slip, and observe, using the microscope. Is your copper chloride or cobalt chloride toxic to Tetrahymena at the concentration used? How do you define toxicity? Record your observations about behavior and morphology changes in Tetrahymenaafter exposure to heavy metal. How do you know what is normal behavior and morphology? If you decide to use lack of movement as your criterion for toxicity, how will you determine what is self-propelled movement vs. water flowing on your slide? Should you include a control? YES! What would the appropriate control(s) be? Test the remainder of the dilutions of cobalt or copper chloride solution and determine if concentration is important in the toxicity of your compound. Make a table in your lab notebook to record your data. Don't forget to calculate final concentration (in moles) of the heavy metal every time you use a different dilution and record that information in your lab notebook. Use final (effective) concentration, not dilution factor, in your data table or axis labels in a graph made from the data and in your results analysis. We should have time today for you to work with your partner to design your own experiment to answer one of several questions that may have come up from your observations or from your reading about Tetrahymena phagocytosis in the last few weeks. Your instructor will explain your options and she/he will give you a research paper or other information related to the question that you and your group chooses to explore. The information given should help you figure out an appropriate concentration of your test variable to use in your experiment. Related research papers should also help you formulate a hypothesis. Begin this project by reading the backgound information in the next lab description at Lab 4: Variable Testing in Tetrahymena. Before you leave today, have a rough draft of your experimental protocol (including showing how you will make all working solutions of reagents) approved by your instructor. If necessary, you and your group should meet with your instructor in the next few days to finalize your plan to address your question with a well designed and controlled experiment to be performed in LAB 4. Place used serological pipettes tips down in pipette canister to soak. Place used micropipette tips in the trash. The binocular head must be rotated into the storage position, to protect the ocular lenses from damage. Loosen the setscrew on the right, rotate the head 180°, then tighten the screw. Turn off the microscope light. Finalize your experimental protocol for your self-designed experiment and have it approved by your instructor. Write a results section of a scientific report on your findings in the Tetrahymena toxicity experiment. You should have a narrative portion and at least 2 data displays with proper legends integrated into the narrative. (One figure should be a photomicrograph or comparative photomicrographs done as a composite single figure and the other data display could be a table or a graph). Refer to the appropriate parts of the Scientific Writing Guidelines in the Resources section of the wiki for help. The Gronlien article we discussed is a good model for how to write a results narrative and what to include in figure legends. It is also shows you how to use photomicrographs as data. You have been given a stock glucose solution with a concentration of 100mg/mL. To perform the glucose assay in lab today, you must dilute the 100mg/mL stock solution of glucose to concentrations of 80mg/mL, 60mg/mL, 40mg/mL, and 20mg/mL. You need to prepare 1mL of each dilution. Explain how you would make the 4 dilutions from the glucose stock solution. The molecular weight of glucose is 180g/mol. To prepare a stock solution of glucose, you dissolve 1.8g of glucose in water to a final volume of 1.0L. This stock solution is then diluted as follows: 50mL of the stock solution is added to 450mL of water, and then 1.0mL of the diluted solution is added to 99mL of water. What is the µM concentration of the final solution? You have been given 10 ml of a Tetrahymena culture that contains 8 x 1010 cells/ml. How would you prepare 20ml of a culture containing 4 x 105 cells/ml using a portion of the original culture and sterile media? You are writing a research report and you need to describe the concentration of methyl green stain on the Tetrahymena you show in a photomicrograph. The concentration of methyl green in the bottle was 5% and you added 100 μL of it to 9.9ml of an acidic buffer to make a working dilution of stain. You then combined 10 μL of that diluted stain with 40 μL of your diluted cells and put a few microliters of that mixture on the slide from which you took your photo. What was the effective (final) concentration of the stain? A published journal article you read says that, "To determine the prey concentration that gave optimal phagocytotic uptake,dose/response curves for both latex beads and deciliated T. thermophila were obtained (data not shown). The optimalconcentrations were 106 beads ml–1 and 105 cells ml–1". If you wanted to do a similar experiment using 0.1ml of beads mixed with 0.9 ml of Tetrahymena, how would you dilute the stock beads (1010/ml) to make 0.2ml of an intermediate conc. of beads (working dilution) so you would achieve the appropriate final dilution of 106 beads ml–1? This page was last edited on 6 December 2010, at 12:55.